Innovative technologies paved the way for Smart Farming’s emergence in the Internet of Things landscape. LPWAN in particular supplies a range of features in terms of energy consumption and long-range transmission, in other words the main network requirements for the Smart Farming sector’s key applications. Where are we today in terms of adoption? Network coverage is an added impediment to investment. A very large (and significant) percentage of farmers are not “connected”, added to which network coverage in rural areas tends to be poor. What will drive the market forward in the medium term? Data is a major enabler for Smart Farming. The issues and challenges are similar to those we seen in the connected health sector. The ability to interpret these data can enable farmers to optimise and better monitor the health of their livestock. So there is a real need for task-specific expertise in these agronomist models. IBM Research estimates that 90% of yield losses are due to weather conditions: by combining weather forecasting models and precision agriculture techniques, these losses could be cut by 25%. One added bonus is that the use of smart solutions helps to reduce paperwork considerably. For instance, trackers on farming equipment eliminates the need to keep a manual log of operators’ work hours. They also reduce the ability to commit fraud. What outlook and forecasts for the market in the coming years? 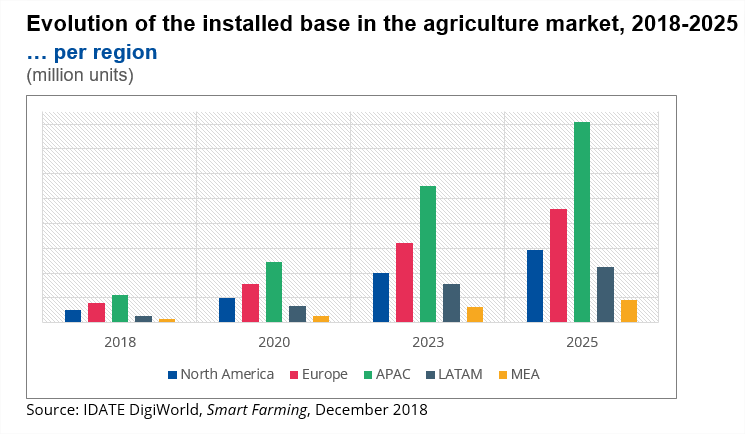 In 2025, there will be some 40 million Smart Farming devices in use worldwide, including growing and livestock apps and apps for farm equipment. Asia-Pacific is expected to be the market leader for the period running from 2018 to 2025. Buy our last report : "Smart Farming"